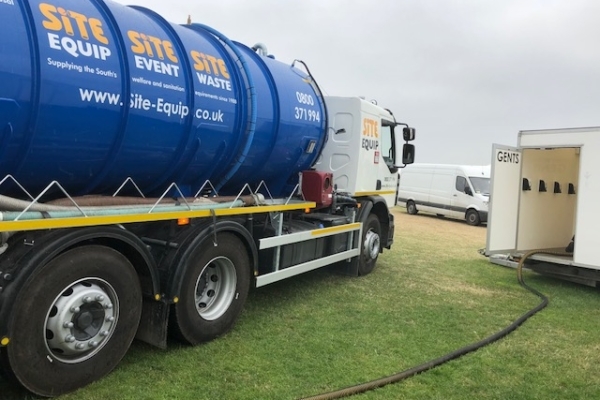 Site Waste can provide a toilet trailer cleaning and replenishing service to your construction or event site. The service includes emptying the waste, cleaning the trailer and replenishing items such as hand wash, toilet rolls and paper towels. We can now service your own toilet trailer, as well as those on hire from ourselves. We have a dedicated team of service drivers, all NSQ (National Sanitation Qualification) qualified, with years of experience under their belts, so you can be sure that you will receive a professional service! As well as our toilet trailer cleaning and replenishing, we also provide single portable toilet emptying. Why order your Toilet Trailer Cleaning and Replenishing from Site Equip? Professional Service, our toilet trailer cleaning and replenishing is the best in the UK, with our service operators completing their Level 1 National Sanitation Qualification and two winning service attendant of the year! Please get in contact if you would like to find out more about our toilet trailer cleaning and replenishing service. You can call our friendly sales team on 0800 371994.